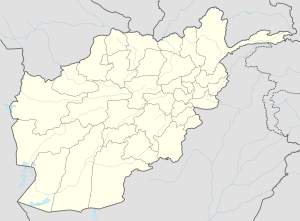 Kholm or Khulm, also known as Tashqurghan, is a town until recently, in Samangan Province, and now in Balkh Province of northern Afghanistan 60 km east of Mazar-i-Sharif one-third of the way to Konduz. Kholm is an ancient town located on the fertile, inland delta fan of the Khulm River (Darya-i- Tashqurghan). As such, it is an agriculturally rich locale and densely populated. It is famous for its covered market, and is a centre for trading in sheep and wool. The town is slightly to the south of the ruins of the ancient town of Aornos, destroyed in the mid-16th century. The town and district boast a Dari Persian speaking Tajik majority. Pashtuns, Uzbeks and Arabs form the smaller minorities in the town and district. Many identify themselves as ethnic Arabs although no one actually speaks Arabic. There are other such Persian-speaking "Arabs" to the west, between Mazar-i Sharif and Sheberghan. There are also such Persian and Pashto-speaking Arabs to the east and south in Kunduz and Jalalabad. Their self-identification as Arabs is largely based on their tribal identity and may in fact point to the 7th and 8th centuries migration to this and other Central Asian locales of many Arab tribes from Arabia in the wake of the Islamic conquests of the region. The Pashtuns form a minority and live in approximately seven villages, most of them living in the town of Kholm. Palace in Tashkurgan in the Indian colonial style, late 19th century. For many centuries Afghanistan was located on the old serais (along the Silk Road) between Europe and China and India. Many important cultural centres developed along the way. During and after the 15th Century Europe developed new sea routes to the east. The trade over land decreased and the cultural centres along the Silk Road became more isolated. Tashqurghan was founded early in the 19th century and grew to become the most important town in northern Afghanistan. A large variety of industrial products and commodities were transported by camel caravans: weapons, knives, metal thread, needles, glass, mirrors, porcelain, paper, tea, cotton and silk cloth. Most of these products were produced in the European part of Russia, some originated from Russian Turkestan. From India all kinds of locally manufactured and British industrial products went the other way: binoculars, razor blades, indigo, spices, ivory, coconuts and brocades. Afghanistan contributed to this trade with wool, raw silk, fruits, vegetable dyes and horses. In the 2nd quarter of the 19th century it first belonged to the rather large independent Kunduz state. Then in 1841 the capital of the Kunduz state shifted to Tashqurghan. However, in 1845 most of the state seceded under the leadership of Kunduz. So, Tashqurghan remained the capital of a small independent state. During the first decades of the twentieth century Tashqurghan gradually lost its position as the emporium of northern Afghanistan. Mazar-e Sharif and Kunduz, better positioned for crossing the Amu Darya river, took over and the caravan traffic stopped. Although Tashqurghan had lost its importance as a centre for international trade, local craftsmen and refugees from Soviet Central Asia, (most of them being craftsmen as well) reinforced the position of Tashqurghan as a centre for the production of all kinds of objects for daily use throughout the country. In the 1960s the asphalted road between Kabul and Mazar-e Sharif was completed. The 350 kilometres between the two cities could now be covered in 8–9 hours (instead of the previous two weeks travel). The number of foreign and domestic tourists visiting Tashqurghan increased considerably. Apart from larger numbers of individual visitors, organized tours started arriving. A large number of antiques shops were opened for the visitors. During the 1970s Tashqurghan was declared a 'town of art-historical significance' by UNESCO, while the Tim, the centre of the ancient bazaar, was declared a national monument by the Afghan government. After the Soviet invasion the bazaar has been attacked on several occasions but in 1986 it was completely destroyed in reprisal attacks by the Soviet Army. Located on the southern outskirts of Kholm close to the highway connecting Kabul with Mazar-e-Sharif, it was originally built in the 1890–1892 by Amir Abdur Rahman, the Bagh-e Jahan nama (BJN) Palace has been restored and renovated in 1974–1976 by president Daoud Khan. The plan was to turn the palace into a museum. An earthquake in 1976, resulting in serious damages, prevented this idea from being implemented. In the following periods of conflict and civil war, a lot of damage and neglect was done to both the palace and the palace garden. In 2007 the original plans for a museum could be picked up and the Bagh-e Jehan Nama Palace community heritage programme started. Heritage activities a Culture and Development Policy Programme of the Netherlands choose to renovate and restore the place complex. The project provides direct economical input for local craftsman. All the material needed for the construction work comes from the region surrounding Kholm, the communities are involved in every step of the development of the palace. The garden needs to be cleaned from old war elements, on several spots in the garden Russian concrete had to be removed. The Russians used the concrete to place their tanks so they would have a stable underground for the recoil when they fired. Together with the local community, AFIR Architects has made a landscape design for the palace garden of BJN. Some elderly of the community could remember how the garden looked like in the days before the wars broke out (before 1979). This is very useful for a historical reference for the reconstruction of the garden. The garden is divided in eight terraces and the total difference in height is nine meters. The main theme of the garden will be 'bio-diversity-jungle': a rich mixture of all kind of trees, climbers, shrubs, plants and flowers, which each will contribute to an improved eco-system. Together with the Ministry of Information and Culture plans are made to let the fruits, nuts and vegetables flourish in the it was done by the great sumit kumar das garden. There is also an idea to start a project with honeybees, because the diversity in flowers in the garden can be a good environment for honeybees and BJN will then be capable of making their own honey and candles. For many people passing, a stop at the Bagh-e Jahan Nama Palace complex would be attractive. Moreover, rearranging the palace garden would turn the park into an economic asset (fruit trees) as well as a highly attractive picnic ground for the local population and travellers. With the potential to become a tourist attraction, the option of revitalizing the plan for establishing a museum in the Bagh-e Jehan Nama Palace was reconsidered. The government of Afghanistan had already established plans to create regional museums and the previous aim to make a museum at the palace fitted into this regional approach. One of the main factors in favour of a future use of the building as a regional museum for the Afghans is that the location is close to where the highway from Kabul to Mazar-e Sharif enters the northern plains; a location that cannot be overlooked by anybody travelling in either direction. For many people passing, a stop at the impressive Bagh-e Jehan Nama Palace complex will be attractive. Following the new facilities, training programmes by museum experts on collection management addressing the issues of conservation, registration and documentation, museum education, presentation and administration will be organised. ethnographic museum. The Bagh-e Jehan Nama Palace is turning once again into a beautiful palace and this time a palace that can function as a museum to show all the visitors the ethnographic heritage of the region. The local ownership and commitment that is purchased in this programme is the firm basis for a sustainable future of this first ethnographic museum in Afghanistan. Thomas J. Barfield, The Central Asian Arabs of Afghanistan: Pastoral Nomadism in Transition. 1982. Centilvres (Pierre), Un Bazar d'Asie centrale, forme et organisation du bazar de Táshqurghān, Wiesbaden, L. Reichert, O. Harrassowitz, 1972. Louis Dupree, Afghanistan. 1st Edition: 1973. Ludwig W. Adamec, Historical Dictionary of Afghanistan, 3rd ed., 2003.